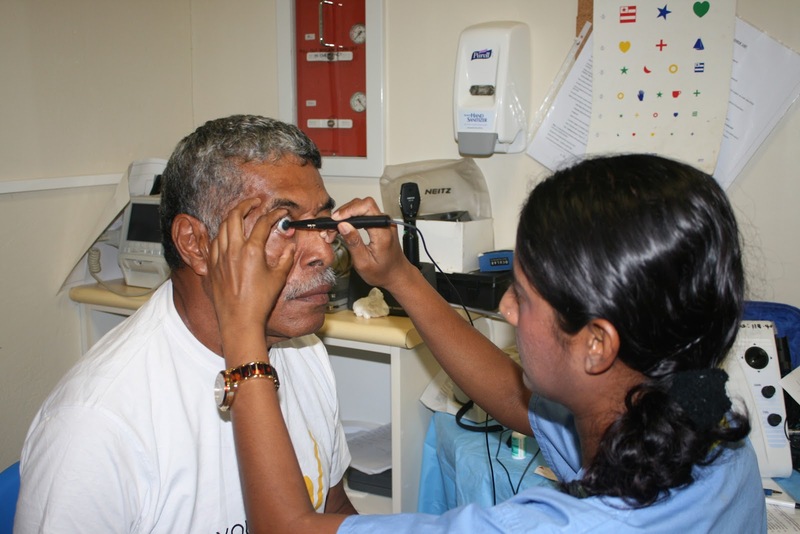 “The timing of the 10th Taveuni Eye Project in October 2015 could not have been more perfect for patients. All patients have returned to their homes, families and friends and were able to participate in the Christmas and New Year celebrations. For many it was the first for a long time, so consequently very special,” said Project Lead, Rotary Club of Taveuni Island President Geoffrey Amos. “In the developing world, every blind poor person has a family member who is chosen to be his or her caretaker. Frequently it is a child who becomes the “seeing eye child” for the blind person. Neither can attend school, work, or provide for the family, prolonging the cycle of poverty,“ commented Head Surgeon Doctor Jeff Rutgard. Over the last ten years, the Taveuni Rotary Club has come to the aid of the visually impaired throughout Fiji by reaching out to them, giving 2500 of them a second chance, a chance to see for the first time for children born with cataracts and for adults to see again after being blind for years. Worldwide support for the Taveuni Eye Project has made all this possible. What a marvelous gift for the patients and their families. Without the wonderful team of supporters and volunteers, the largest totally free Cataract Surgery Program would not take place. Support comes in many ways; some give their skill and time, some people provide vital funding, and others contribute food, accommodation and transport. This successful project grows year by year. Last year 33 volunteers from Fiji, New Zealand, USA and Australia were involved for two weeks. Each year the project raises $FJ150,000 to provide this vital service to people in rural and remote communities, and each year it gets harder to fund the project. The project has both local and overseas donors. Local Taveuni Island donors grow one ton each of dalo and cassava, others supply vudi, pineapple, bananas, pawpaw and meat. In this unique project, the patients pays nothing, irrespective of where they live. The project pays all transport, accommodation, meals, surgery and post-operative medication for door to door via the Taveuni Island Hospital. In its 10th year, the project team returned full vision to 339 eyes for 255 patients including 4 children. All patients returned to their homes with renewed vigor for life as full working members of their community, with the children now able to go to school. Once the yearly fundraising is complete and everything is planned, the volunteers all arrive and commence the numerous tasks required to take care of the patients. The Logistics Team arrange the travel for patients coming from all over Fiji, coordinating passenger services (including ships, buses, ferries, hire vehicles and donated local vehicles), the number of patients arriving and departing daily, planning surgery numbers, liaising with Patient Services for beds and food, attending to the Theatre Team’s requirements. They are the first to arrive at the hospital in the morning and last to leave at the end of the day. Past President Michael Prasad has done this role for all of the last ten years. Over the same time period, Rotarian Joey Korovata has managed the Patient Services Team. They produce all the meals (totaling approximately 2500 over the two weeks), wash thousands of sheets, pillow cases and towels, and of course make the beds and care for patients. The Medical Team carry out the medical procedures and supply the very best of care for the patients. With 35 operations per day, sometimes three at once, plus the pre-screening and post-operative care, their days are full from 6.30am to 6.00pm. “I witnessed patients who had travelled for over 36 hours who were so happy to be there and so appreciative of the work that this incredible group of people accomplish. These patients who are transported, accommodated and fed while having their sight restored, all provided by Rotary Foundation Global Grant, donations of money, voluntary time and the gift of love. It is a truly an amazing humanitarian project,” concluded District 9920 Governor Jennie Herring. Planning and fundraising has already commenced for the 11th Annual Taveuni Eye Project. To find out more, go to the Rotary Club of Taveuni Island’s website www.rotarysouthpacific.org/club.cfm?ID=365 or contact Geoffrey Amos directly via raikivi@me.com.